“It will be a holy place where humanity and harmony will unite,” India’s Prime Minister Narendra Modi said of the first traditional Hindu stone temple in the Middle East, which is to be will be built in Abu Dhabi by 2020. Speaking from Dubai Opera on a state visit to deliver a keynote speech at the World Government Summit, Mr Modi also called on expatriates to work doubly hard to reach their dreams and aspire to achieve the country’s ambitions of greater inclusion of all. Modi watched the live feed of the temple foundation ceremony in Abu Dhabi, launched the project of the capital’s first Hindu temple and revealed a model that showed a marble and stone monument with seven spires to reflect the Emirates. He said all Indians are “eternally grateful” to the UAE and the Crown Prince for granting land and permission for Abu Dhabi’s first temple. Referring to the plans of his government to uplift the poor, he said attitudes had moved from despair and frustration that change was impossible to asking questions of the government about when it would happen. “That question does not reflect a complaint, it is being asked of us with confidence that we will deliver,” he said. India was undergoing a transformation, the prime minister said. Chants of “Modi, Modi” from the assembled crowd interspersed his speech. “The world says the 21st century is Asia’s century. This will not fall into the palm of our hand. We must strive and work hard,” he said. He also referred to the agreements signed with the UAE late on Saturday and mentioned the oil exploration and other memorandums as pathbreaking. Indian sadhus, or holy men, conducted a shila pujan or foundation stone laying ceremony at Abu Mureikhah, off the Dubai-Abu Dhabi Highway for the Middle East’s first traditional Hindu stone and marble temple on Sunday. The hour-long puja or prayer inaugurated the site in the Al Rahba area and marked a religious sanction for construction to begin on the 55,000 square metre plot of land. Prime Minister Modi watched the puja over a live satellite feed that was broadcast to the Dubai Opera, where he addressed the Indian community. Plans and information about the temple were presented to Mr Modi and Sheikh Mohammed bin Zayed, Crown Prince of Abu Dhabi and Deputy Supreme Commander of the Armed Forces, by members of the temple committee before delegations began talks on Saturday. 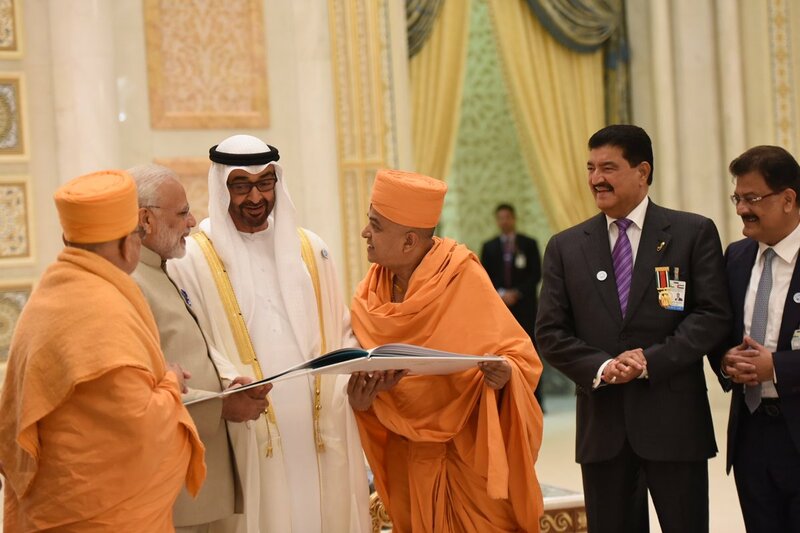 The announcement of land granted by the UAE government for a Hindu temple in Abu Dhabi came during Mr Modi’s first visit to as prime minister to the country three years ago. Both countries have a shared bond through the values of tolerance, respect for religions and peaceful co-existence. There are two Hindu temples in Dubai, one Sikh gurdwara and several Christian churches in the Emirates. The Abu Dhabi Hindu monument will be the capital’s first temple. “We are at the centre of all the excitement. We are targeting 2020 and let’s hope that all goes according to plan. This is a noble gift from the Royals of the UAE to the Indian community. It is a dream come true,” said a volunteer with knowledge of the project. Mr Modi’s engagement with the Indian community was his second address to expatriates in Dubai in three years. Some 2,000 Indian expatriates patiently waited at the Dubai Opera for more than an hour to complete security checks before their prime minister arrived. During the first visit of an Indian prime minister to the UAE in 34 years in August 2015, he was greeted by more than 50,000 expatriates at the Dubai International Cricket stadium. The relationship between the two nations has strengthened since Mr Modi took office four years ago. His visit three years ago generated plans to invest US$75billion in an Indian infrastructure fund. The bonds have grown from age-old maritime trade ties to commercial links and engagement in security, joint defence production, space collaboration, information technology and counterterrorism. Mr Modi earlier on Sunday paid his respects to fallen UAE soldiers at the Wahat Al Karama, monument in Abu Dhabi on the last day of his two-day visit to the country.